(Nanowerk News) Physicists at the University of Sussex are at an advanced stage of developing alternative touchscreen technology to overcome the shortfall in the traditional display, phone and tablet material that relies on electrodes made from indium tin oxide (ITO). The study, led by Sussex Professor of Experimental Physics Alan Dalton, investigates some of the intricacies of patterning silver nanowire films to produce detailed electrode structures. The paper is published in the journal Nanoscale ("Finite-size scaling in silver nanowire films: design considerations for practical devices"). Previous research by Professor Dalton’s group has shown that silver nanowires not only match the transmittances and conductivities of ITO films but exceed them. 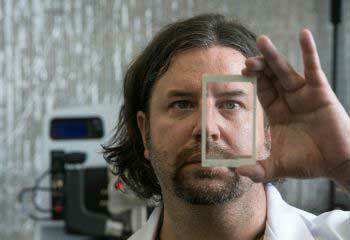 This makes the material very attractive for touch screens. However, the group have now shown, for the first time, that this type of nanomaterial is compatible with more demanding applications such as LCD and OLED displays.